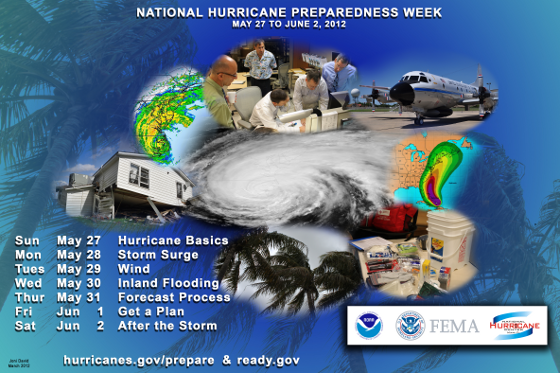 The goal of NOAA's Hurricane Preparedness Web site is to inform the public about the hurricane hazards and provide knowledge which can be used to take ACTION. This information can be used to save lives at work, home, while on the road, or on the water. Every year, hurricanes put communities at risk of catastrophic damage from storm surges, flooding, high winds, and tornadoes. During National Hurricane Preparedness Week, we rededicate ourselves to preventing loss of life and damage to property by raising awareness about hurricane hazards and taking action to protect our families, our homes, and our neighborhoods. As we mark the beginning of hurricane season, let us recommit to ensuring the safety of our loved ones and our communities, and to building a stronger, more resilient Nation. NOW, THEREFORE, I, BARACK OBAMA, President of the United States of America, by virtue of the authority vested in me by the Constitution and the laws of the United States, do hereby proclaim May 27 through June 2, 2012, as National Hurricane Preparedness Week. I call upon government agencies, private organizations, schools, media, and residents in the coastal areas of our Nation to share information about hurricane preparedness and response to help save lives and protect communities. Tropical Storm Beryl, with sustained winds of 70 mph, became the strongest tropical cyclone to make landfall in the U.S. before the official June 1st start of the Atlantic hurricane season. It made landfall just after midnight (local time) on the night of May 27, 2012, near Jacksonville Beach, Florida. Beryl brought welcome rain to parts of the drought stricken Southeast including parts of Florida, Georgia, and the Carolinas before heading back out to sea. 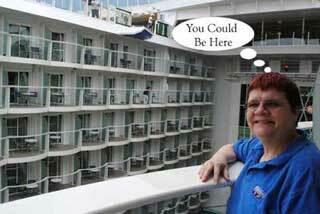 No reported cruise ship itinerary changes at this time. ALL COASTAL TROPICAL STORM WARNINGS HAVE BEEN DISCONTINUED. THE COASTS OF NORTH CAROLINA TODAY. NOAA’s Climate Prediction Center released its annual Spring Hurricane predictions today. 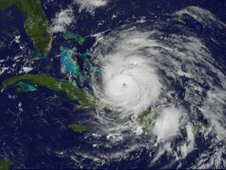 Atlantic: Conditions in the atmosphere and the ocean favor a near-normal hurricane season in the Atlantic Basin this season. Eastern Pacific: Climate conditions point to a near-normal hurricane season in the Eastern Pacific this year. The outlook calls for a 50 percent probability of a near-normal season, a 30 percent probability of a below-normal season and a 20 percent probability of an above-normal season. In the image above, courtesy of National Oceanic and Atmospheric Administration (NOAA)'s National Hurricane Center (NHC), Hurricane Irene made landfall at approximately 7:30 am EDT on Aug. 27, 2011, near Cape Lookout, N.C. with maximum sustained winds of 85 mph (Category 1). 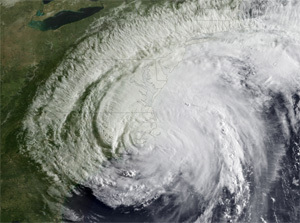 This NOAA GOES-13 satellite image captures Irene’s landfall moment. This was the scariest moment during the 2011 Hurricane Season. NOAA's Climate Prediction Center (CPC) had predicted an active season, but as Warnings Issued for Hurricane Irene, it was also the finest hour for NOAA's NHC as they had accurately predicted the path of the storm four days earlier. In the chart below, the numbers in parenthesis are the averages, so you can easily see that the 2011 Atlantic Hurricane Season was above average, with 2011 ranking as the 14th busiest season since 1966. The 2011 Eastern Northern Pacific Hurricane Season was well above average. Despite predictions of a near-normal season, there were eleven named storms, ten hurricanes and six major hurricanes, all of which were above-average. As is customary, the Colorado State University releases its predictions in April and NOAA releases its predictions in late May. 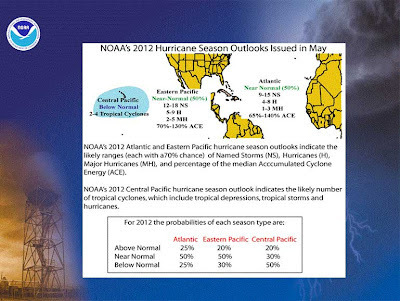 See our blog post, Below Average 2012 Atlantic Hurricane Prediction, for CSU's 2012 predictions. They discontinued their December predictions due to previous inaccuracies. Based on these early season predictions, and despite the early jump start on the Hurricane Season, this year should be near-normal. Of course, that doesn't imply that we should be complacent. It only takes one major hurricane making landfall to cause significant loss of life and property. Schools, day care centers, and other public institutions are closed in Norway due to an indefinite strike called Thursday. Striking workers include port pilots which would impact sailings. Norway is currently experiencing a period of economic growth, and state workers are looking for their share of the pie. Their wages have lagged behind that of the private sector triggering the work stoppage as talks broke down. 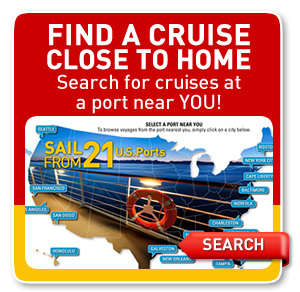 According to Maritime law, a cruise ship must have a pilot onboard the vessel as they enter the port. 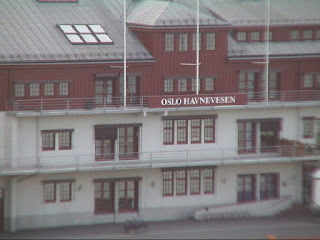 If the strike continues, ships would not be able to dock in Norway ports, including Oslo. According to Norwegian Coast Guard Web site Kystverket, the pilots reached an agreement Friday night, June 2nd, ending a week long strike which had impacted cruise line itineraries. This is excellent news as the popular Norwegian Fjords cruise season is just getting into full swing. 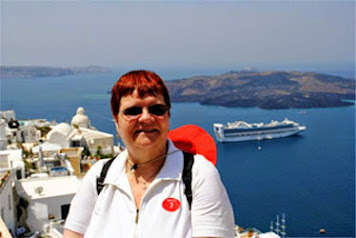 Cruises typically combine the British Isles and Fjords. 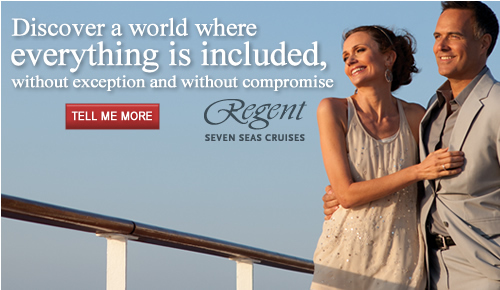 Another option includes a cruise to North Cape and the Arctic Circle. If you've never sailed to Norwegian Fjords, we highly recommend adding that to your bucket list. With all 42 of the Port of Oslo's pilots on strike, a number of cruise ships were turned away or forced to cancel calls. 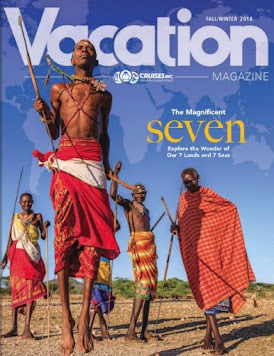 These include Emerald Princess, which was forced to turn away from the port last Friday, Star Clippers' Star Flyer which cancelled a call on Saturday and Royal Caribbean's Vision of the Seas which was diverted to Gothenburg on Sunday. Upcoming calls in Tromsø or Alesund in the next week include: P&O Cruises's Adonia, Royal Caribbean's Brilliance of the Seas, MSC Cruises' Magnifica and two Holland America Line Eurodam and Rotterdam. Fred. Olsen Cruise Lines Balmoral will sail to Kiel Canal, Warnemunde, Copenhagen, Gothenburg, will be at sea on June 4, visit Zeebrugge June 5 and return to Southampton on June 6. The only line that has ships in the region that isn't impacted is Hurtigruten, which sails the coastal waters year-round between Bergen and Kirkenes. They are not required to carry a pilot. Since the port pilots are on strike, and they are required to enter and leave the port, Vision of the Seas will be unable to dock in Oslo on Saturday, June 2, as originally planned. Because of this, it is necessary to modify Vision of the Seas’ boarding and debarking process. On Saturday, Vision of the Seas will arrive in Gothenburg, Sweden, and guests will be transported to and from Oslo via motor coach. Guests on the Saturday, June 2, sailing of Vision of the Seas should proceed to Oslo as originally scheduled. Should the strike continue and include all port pilots in Norway, Brilliance of the Seas’ next sailing will be unable to call to any of the Norwegian ports of call on its itinerary. 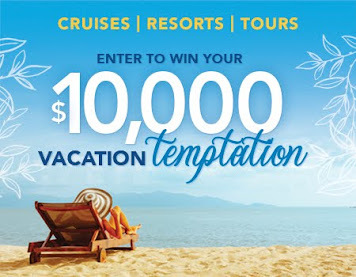 Royal Caribbean has been diligently working to prepare an alternative itinerary should the strike continue, which will include port calls to Copenhagen and Aarhus, Demark, and Berlin (Warnemunde), Germany. We encourage guests on the Saturday, June 2, sailing of Brilliance of the Seas monitor this website for any additional updates. Royal Caribbean International has issued an advisory that Vision of the Seas, which is currently scheduled to conclude its sailing in Oslo on Sunday, May 27, may be unable to enter the port. RCI is currently preparing contingency plans in the event the strike continues and Vision of the Seas is unable to dock in Oslo. They encourage guests on the Sunday, May 27, sailing of Vision of the Seas to monitor the website for any additional updates. Since the port pilots in Oslo are on strike, and they are required to be onboard in order for us to enter the port, if the strike continues Vision of the Seas will be unable to dock in Oslo on Sunday, May 27, as originally planned. Because of this, it will be necessary to modify Vision of the Seas’ boarding and debarking process on Sunday. Vision of the Seas will arrive in Gothenburg, Sweden, on Sunday, and guests will be transported to and from Oslo via motor coach. 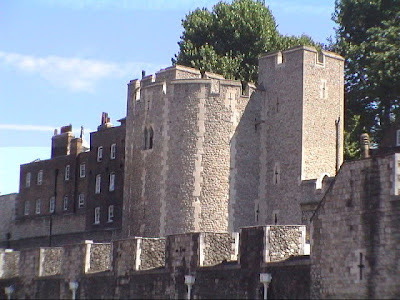 Her Majesty's Royal Palace and Fortress, more commonly known as the Tower of London, is a historic castle on the north bank of the River Thames in central London, England. It lies within the London Borough of Tower Hamlets, separated from the eastern edge of the City of London by the open space known as Tower Hill. Founded towards the end of 1066 as part of the Norman Conquest of England, the Tower had many uses including that of a grand palace and royal residency. 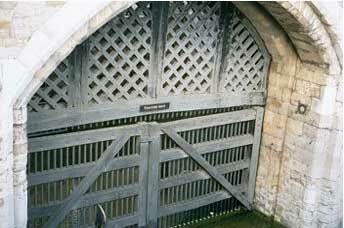 For many centuries it served as a prison, although that wasn't its primary purpose. Other roles included serving as an armoury, a treasury, a menagerie, the home of the Royal Mint, a public records office, and the home of the Crown Jewels of the United Kingdom (still housed there to this day). Allow 2-3 hours for your visit. 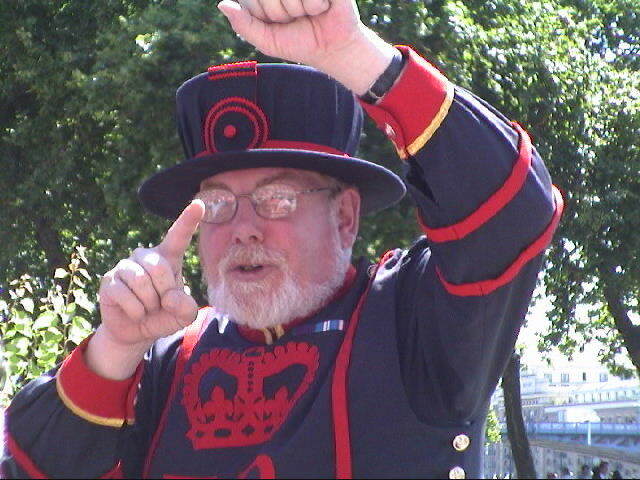 Roam on your own or join a guided tour led by one of the Yeoman Warders (pictured above). Looking at his picture, doesn't he look like he's just full of information and loves to talk? If you think so, you are correct. At some point in time, you might want to deviate from the tour if you've had your fill of history. 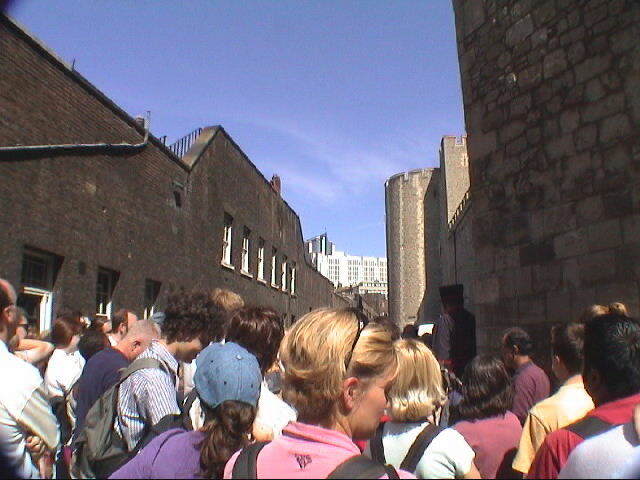 Your ticket includes access to the Tower and the Crown Jewels display plus Yeoman Warder guided tour and talk, live historical re-enactments, White Tower tour, children's activity trails, entry to the Fit for a King and Prisoners of the Tower exhibitions and much more! Are you enjoying this special series on London? We'd love to hear from you. Our Facebook Fans are getting a treat to some additional images, so be sure to Like us. Directions: Use District or Circle lines to Tower Hill station. Follow directional signage to the Tower. The main entrance is a five minute walk from the station. Tower Gateway Station is located adjacent to Tower Hill station. Follow directional signage to the main entrance of the Tower. Directions: Riverboats for Tower Pier depart from Charing Cross, Westminster and Greenwich. Thames Clippers' fleet of hi-speed catamarans operate daily with departures every 20 minutes from both London Bridge Pier and Tower Pier. compared with the 1981-2010 climatology. The season begins June 1st and continues through November 30th. Their current (April 4th) forecast calls for below-average activity in the Atlantic this Hurricane Season. They discontinued their December forecast this year citing previous inaccuracies. The scientists are anticipating a below-average probability for major hurricanes making landfall along the United States coastline and in the Caribbean. However, coastal residents are reminded that it only takes one hurricane making landfall to make it an active season for them, and they need to prepare the same for every season, regardless of how much activity is predicted. The tropical Atlantic has anomalously cooled over the past several months, and it appears that the chances of an El Niño event this summer and fall are relatively high. The April forecast calls for 10 named tropical storms with 4 strengthening to hurricane status. Of those hurricanes, 2 are predicted to be a major hurricane (Category 3,4, or 5). Another reason why Colorado State University publishes forecasts is for hurricane preparedness. We too are publishing this information, along with updates throughout hurricane season, to help protect life and property when danger approaches. 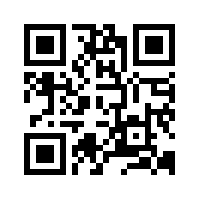 Additional information and links can be found on the Weather Tab of this blog. Continuing our series on What to do in London, if you are only there for two days, we'll head out by train to Windsor Royal Station for a visit to one of the queen's residences, Windsor Castle. The Queen uses the Castle both as a private home, where she usually spends the weekend, and as a Royal residence at which she undertakes certain formal duties. In the springtime, she takes up residence for the entire month around Easter (March - April). This is known as the Easter Court during which she holds several 'dine and sleeps' events for guests, including politicians and public figures. Windsor Castle is often used by The Queen to host State Visits from overseas monarchs and presidents. Foreign Heads of State enter the Castle in horse-drawn carriages through the George IV Gateway into the quadrangle in the Upper Ward, where a military guard of honour is drawn up. Many Royal weddings have been celebrated in St George's Chapel, as well as funerals such as those of Princess Margaret and Princess Alice, Duchess of Gloucester, have also taken place there. Queen Elizabeth The Queen Mother lies buried in the Chapel with her husband, King George VI, and Princess Margaret, her younger daughter. Many parts of the Castle are open to the public, including the precincts, the State Apartments, Queen Mary's famous dolls' house, St George's Chapel, and the Albert Memorial Chapel. 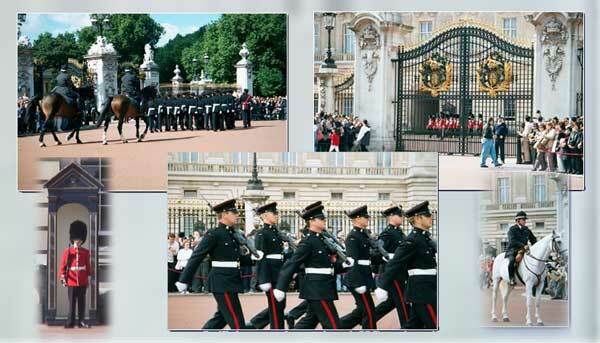 When The Queen is in official residence, Changing the Guard provides a colourful spectacle in the quadrangle. At Horse Guards Arch, Changing the Guard takes place daily at 11.00 am (10.00 am on Sundays) and lasts about half an hour; it is normally held on Horse Guards Parade by the arch of Horse Guards Building. The Guard Mounting is held daily May - July. 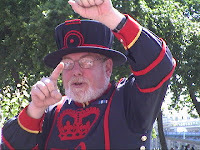 By train: To Windsor from London Waterloo or London Paddington (National Rail Enquiries Service 08457 484950 (UK)). For more information about Windsor and parking, please visit www.windsor.gov.uk. 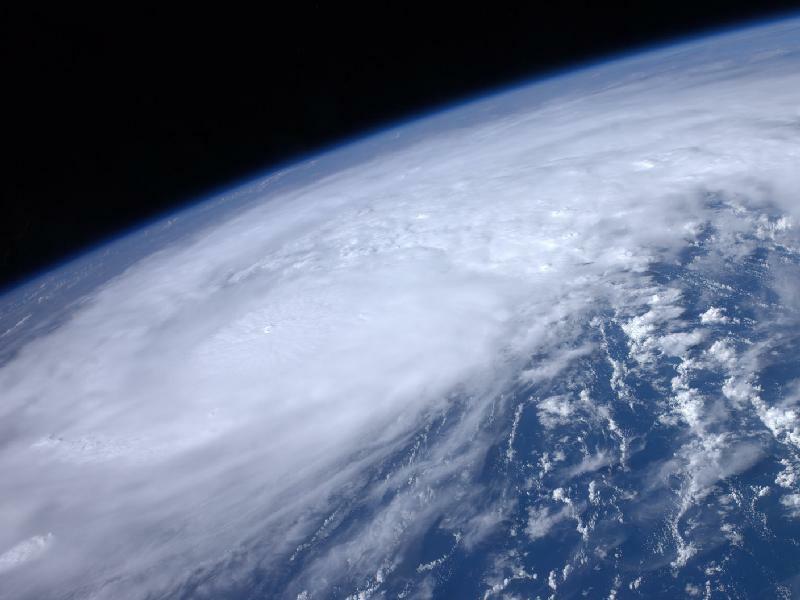 Last year, the first few storms of the East Pacific Hurricane Season became Hurricanes. So far this year we've had one named storm and the second Tropical Depression looks like it will strengthen into named storm TS Bud and potentially continue to grow in intensity and become a hurricane. The current 5-day track has it making landfall. Bud is a Category Two Hurricane on the Saffir-Simpson Hurricane wind scale. Some weakening is forecast on Friday, but Bud is still expected to reach the coast of Mexico as a hurricane. BUD IS EXPECTED TO WEAKEN TO A TROPICAL DEPRESSION ON SATURDAY. AMOUNTS COULD PRODUCE LIFE-THREATENING FLASH FLOODS AND MUD SLIDES. NEAR AND TO THE EAST OF WHERE THE CENTER OF BUD MAKES LANDFALL. Hurricane Season in the Pacific doesn't officially start until May 15th, but there already is a named storm South of Manzanillo, Mexico. Tropical Storm Aletta strengthened to a named storm just 12 hours after forming. Hurricane Season in the Atlantic doesn't officially start until June 1st, but there already is a named storm heading along the East Coast of the United States. TS Alberto has started weakening and should dissipate on Thursday. What do you do in London if you only have two days ? Assuming that you are flying over to London from the United States, you'll arrive at London Heathrow Airport around 8 AM. Gathering your luggage and clearing customs will take some time. Depending on where you are staying in London, you'll take a cab, train, tube, or prearranged limo to your hotel. Check-in isn't until 2 or 3 PM, and they really mean that in most cases. They may take your name, but in all likelihood, they won't have a room cleaned for you yet. The hotel will check your bags, and off you go to start your London adventure ! Guard Ceremony. We suggest you head their directly from you hotel so that you can find a good vantage point for the ceremony. Changing the Guard or Guard Mounting is the process involving a new guard exchanging duty with the old guard. Guard Mounting takes place at 11.30 am. It is held daily from May to July, and on alternate dates throughout the rest of the year. 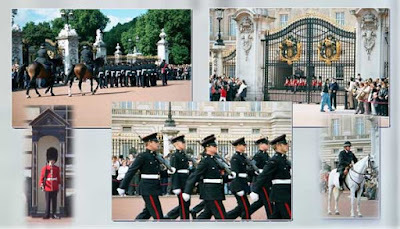 For exact schedule, see the official site of the British Monarchy. If you've seen the ceremony here before, you can also see it at Windsor Castle. We'll feature that in another article. 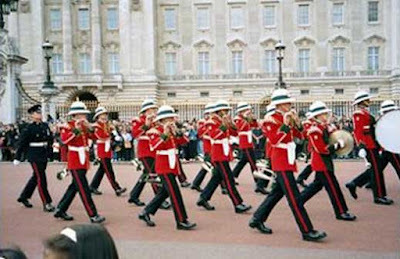 The Guard which mounts at Buckingham Palace is called The Queen’s Guard and are made up of soldiers drawn from one of the five regiments of Foot Guards in the British Army: the Scots Guards, the Irish Guards, the Welsh Guards, the Grenadier Guards and the Coldstream Guards. The handover is accompanied by a Guards band. The music played ranges from traditional military marches to songs from films and musicals and even familiar pop songs. 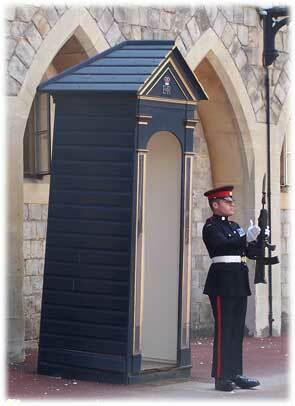 When The Queen is in residence, there are four sentries at the front of the building. When she is away there are two. Buckingham Palace has 775 rooms. These include 19 State rooms, 52 Royal and guest bedrooms, 188 staff bedrooms, 92 offices and 78 bathrooms. Although in use for the many official events and receptions held by The Queen, the State Rooms at Buckingham Palace are open to visitors every year. For visitor information, please visit the Royal Collection website. You could easily spend an entire day at Buckingham Palace, especially if you tour the State Rooms. If you have limited time, you may want to visit some other London attractions. 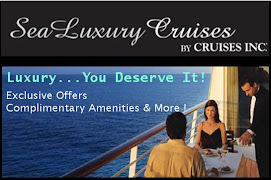 We will give you several selections and the fun will be planning your visit in advance. You may want to have alternatives in mind in case the weather doesn't cooperate. The ceremony is not held in extreme wet conditions.